A great inflatable for toddlers. 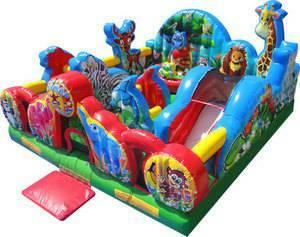 This unit has a bouncer, a 2' slide, mini tunnels and obstacles to crawl around, and much more fun. This unit is a great addition to parties where the toddlers are too young to play with the older kids. They get to have their very own fun too!!! Order today.